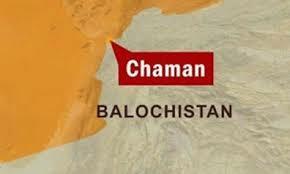 A district police officer (DPO) was martyred and four policemen among 18 people sustained injuries in a suicide blast near the Levies Headquarters at Chaman area of the Killa Abdullah district on Monday. According to Levies officials, DPO Sajid Mehmond along with the police personnel were patrolling in the area near Murghi Bazaar when a suicide attacker riding a motorbike blew up himself near DPO vehicle. As a result, DPO Sajid Mehmond was martyred on the spot while others suffered wounds. Law enforcement agencies reached the site and cordoned off the entire area and started collecting evidence from the spot. However, the emergency was imposed in respective hospital following the blast. In their separate messages, Prime Minister Nawaz Sharif and Balochistan Chief Minister Sanaullah Zehri strongly condemned the attack on the police convoy in Chaman. Prime Minister Nawaz expressed deep grief and sorrow over the loss of precious lives in the attack. He prayed for eternal peace of the departed soul and grant of courage to the bereaved families to bear this irreparable loss. He directed for the best possible treatment for the injured and prayed for their early recovery. Chief Minister Zehri said that DPO Sajid Mehmond was a brave and an honest officer of the police force. He also directed to the Health Department to take all measures to ensure the victims treatment in respective hospital. Home Minister Sarfaraz Bugti also condemned the incident and expressed heartfelt grief and sorrow over the tragedy. On Monday, at least two FC personnel were martyred and five others injured in an Improvised Explosive Device (IED) blast occurred at Lakka Tegga area in Kurram Agency. Kurram Agency Officials said that the personnel of the Frontier Constabulary were targeted through an IED at Lakka Tega area when they were bringing water. As a result of the explosion, two personnel were martyred and five others injured. The dead identified as Ismail and Hukum Gul while injured are Gul Saadat, Zamin Khan, Matiullah and Sajid. The injured were shifted to a nearby hospital. The security forces reached the spot and started the search operation.